No sooner had I posted about some of the goodies at the market last weekend than I get word that it might not be there when I get back from LA. The short version is that the farmer who has been bringing the majority of the great quality produce to the market plans to pull out because they aren’t getting enough business. Below is the message from Tara, who has been involved with the organizing for the market. It includes some solid steps that each of us can take to help save the market. Please read through, but the key thing to do would be to come out to support the market and to tell as many people as you can about it. I know at this point some of you are probably sick of my Farmer’s Market emails, but I ask that you please bear with me yet again because this is really important. On Saturday while I was at the market, we got word that Migliorelli Farms, the sole farmer’s vendor at the market at this time, will not be back after this coming Saturday, as the sales at the market have not been enough to cover their expenses (labor and gas) in coming out to the market. While the number of people visiting and purchasing at the market has been increasing (we do customer counts), it has not yet been sufficient. The market has only been open three weeks this season so this is definitely not good for momentum. While the Brooklyn Rescue Mission will not be deterred and there will always be a market on Saturday, this is definitely a setback, as it took many calls and emails on their behalf to get a farm such as Migliorelli to sell at the market and will take even more effort to find a replacement vendor. The BRM is only interested in bringing quality food to the neighborhood so to have a farm like Migliorelli, that also sells in Union Square, was definitely a big step towards having more food equity in the area. Unfortunately, there just hasn’t been enough of a presence by local residents. Bedford Stuyvesant is a large neighborhood and despite the ads in the local papers, blog postings, emails, the several thousand flyers distributed throughout the area, there are definitely still some people we haven’t yet reached, but there are also a lot of people who do know about the market and have chosen to not visit it, for whatever reason. This is unfortunate as those who have visited have been very pleased with the selection, quality, and price of the produce. We’ve also added a fresh bread vendor and the Brooklyn Rescue Mission is still working on bringing more vendors on, such as a honey vendor. This email isn’t to shame Migliorelli as it is understandable that they need to meet their margin and cannot operate at a loss. This is more of a “community call”, as it seems we are proving the case many have been saying about Bed Stuy: that we cannot maintan and sustain a farmer’s market in this community. I don’t believe this, the Brooklyn Rescue Mission doesn’t believe this, and they are working hard to prove these people wrong. You can help by coming out this Saturday, August 1st and visiting the market and doing your produce shopping for the week at the market. I also ask that you keep coming as often as you can after this Saturday but I truly believe that after you come on Saturday and see what the market has to offer, you’ll come regularly on your own because it truly is growing into something the community can be proud to support. I know we all have our likes and dislikes about the community and access to quality food is definitely one of them. 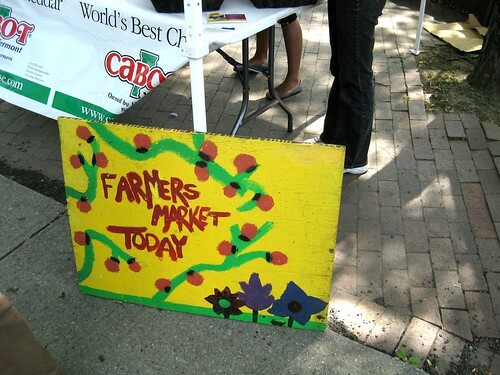 It isn’t enough knowing that there’s a market in the area-we have to support it as well to make it sustainable! Please tell everyone you know! If they live in or near Bed Stuy or love local produce or is just down to support something that helps build community-tell them to come out this Saturday. I hope to see you there. If you cannot make it out on Saturday, you can help us this week by picking up some flyers at the Brooklyn Rescue Mission to distribute-contact me for more information. I have to plug yet again that there are other volunteer opportunities relating to the market so you can contact me about that as well.